Claudio Caniggia “El Hijo del Viento” | Marbella Marbella – Adelante! 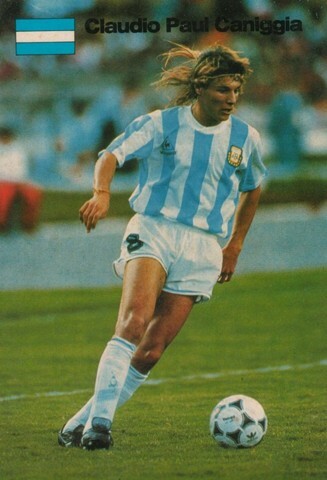 Claudio Caniggia "El Hijo del Viento"
Once capable of running 100 metres in less than 11 seconds, former Argentina striker Claudio Caniggia deserves his nickname El Hijo del Viento (Son of the Wind). Yet it was on the football pitch rather than the athletics track that the blond flyer put his electrifying speed to use, making a unique mark on the game with his trademark runs, which invariably left opposing defenders trailing in his wake. We take a look back at the Albiceleste speedster’s career at the top and finds out what he has been up to since his retirement. 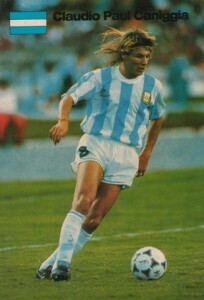 Nurtured in the once-prolific River Plate youth academy, Caniggia burst into the Millonario first team as a fresh-faced 18-year-old in 1985. With his explosive running and intricate dribbling skills, El Pájaro (The Bird), as he was also known back then, was an important squad member of the team that made history in 1986 by winning the league, the Copa Libertadores, the Copa Interamericana and the club’s maiden Intercontinental Cup title. After making his name with River, Caniggia began the first stage of his European travels with a move to Italy’s Verona in 1988, though his finest spell in calcio would come with Atalanta. After returning home and pulling on the Boca Juniors shirt alongside one Diego Maradona, a move for which River fans would never forgive him, he enjoyed his most productive years in the game. However, it was his performances in the national side that would raise Caniggia’s profile and make him one of the country’s leading players. He achieved hero status at the 1990 FIFA World Cup Italy™ when, following a magnificent run by Maradona, he scored the goal that took the Argentina into the last eight at the expense of Brazil. “That was the most important goal of my career, because we were really on the back foot and because of the rivalry we have with them,” he said afterwards. That was the most important goal of my career, because we were really on the back foot and because of the rivalry we have with them. The following year he contributed two goals as Argentina won the Copa America in Chile, where he formed a fearsome strike partnership with Gabriel Batistuta, who made the most of his sidekick’s searing pace. Though his differences with Daniel Passarella led to his omission from the France 1998 squad, Marcelo Bielsa recalled him for Korea/Japan 2002. Yet it was an unhappy tournament for Caniggia, who failed to make a single appearance and was sent off from the sub’s bench during the 1-1 draw with Sweden, a result that sealed Argentina’s surprise first-round elimination. Caniggia, who would never play for his country again, brought his lengthy career to an end two years later, having chosen Qatar as his final port of call. From scorer to scout, Claudio Caniggia clearly still has much to offer the football world.